Beefsteak Wine Club | Boeuf et Liberté! 26 Oct Boeuf et Liberté! 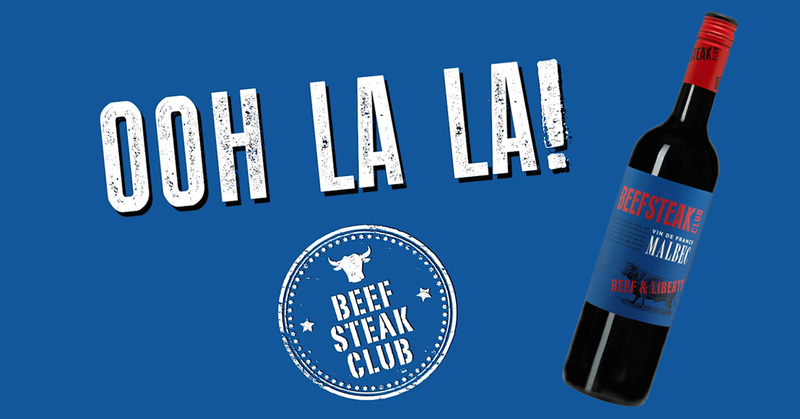 We’re very proud to introduce a superbe new Beefsteak Club Malbec from France to our range. The wine is the first Vin de France Malbec in the Beefsteak Club troupeau and comes from vineyards in the cool climate Limoux area of the Languedoc. Here, the intense sunshine and cooling sea breezes create ideal grape ripening conditions. Just like the other wines in the Beefsteak Club range, the French Malbec is designed to pair well with meat. Grapes are night harvested to retain freshness and the wine is unoaked to reflect pure varietal fruit character. A deeply coloured and full-bodied wine, it has concentrated blackberry and plum notes with soft tannins and a warming hint of peppery spice on the finish. Perfect for pairing with steak-frites and strong cheeses!